Add instant signage to your clothing racks with our Acrylic Sign Holder with Stem and Clamp. 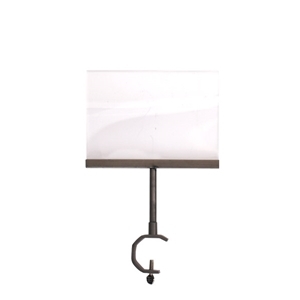 This sign holder features a clear acrylic sign holder with a raw steel finish metal channel, stem and "C" clamp, and can be used on round, square or rectangular tubing. The raw steel finish matches our Hanson Industrial Piping collection as well as our Raw Steel Collection. Use this top loading acrylic sign holder to add product information, sale signs or store information to any clothing rack.